Visitors climb the staircase leading to the eight-and-a-half meter bronze statue of the Virgin Mary. 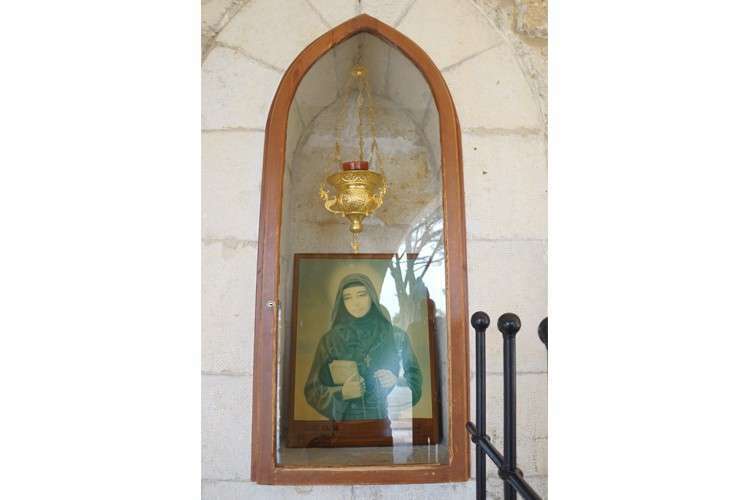 Statue depicting St. Rafqa in her later days which she spent confined to her bed. 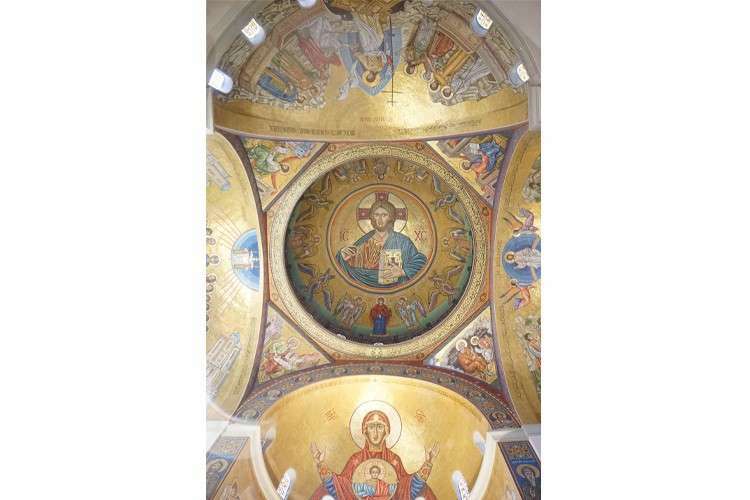 Mosaics at the Cathedral of St. Paul in Harissa. Our Lady Of Lebanon Shrine. 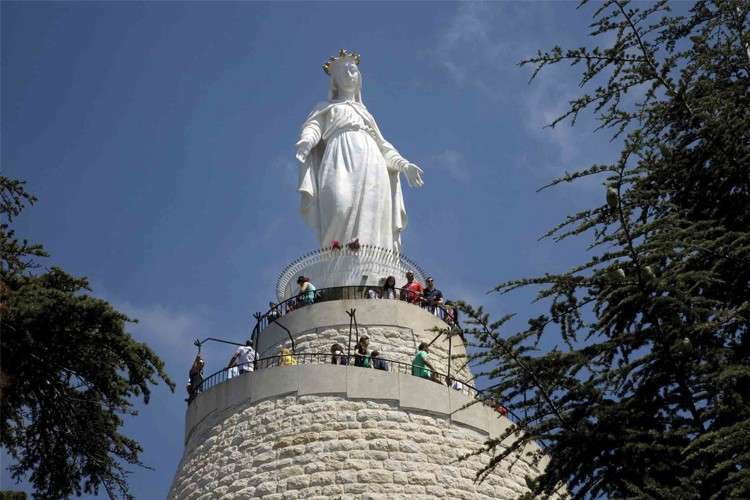 An important pilgrimage site, it draws many devotees to the town of Harissa, where it is located. Devotion. 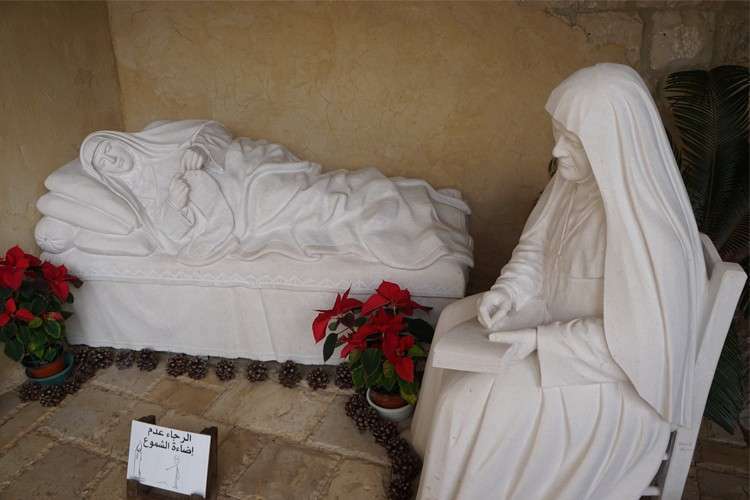 A Lebanese Maronite nun, St. Rafqa, or Rebecca, was canonized by Pope John Paul II on June 10, 2001. I HAVE long wondered why the description ‘standing tall’ has become synonymous with the cedar tree. When I went to the Lebanese Republic last December, I finally understood why. Here, cedars grow aplenty. Seeing its people and their heritage and culture, I must say that it is the cedar in the region. Lebanon is a country in the west of Asia, in the eastern section of the Mediterranean basin. It lies north of Israel and south of Syria. The country somehow acts as an intersection to the East and the West; a country of great diversity and rich glamor. We arrived at the Beirut International Airport where we had our passports stamped. En route to our hotel, we got a glimpse of the cosmopolitan life of the capital city and center of commerce. Beirut city boasts of a very prestigious past. Thousands of years ago, it was a prosperous port on the Canaanite-Phoenician coast, and an important commercial center because it acted like a crossroad for both eastern and western civilizations. We set out for a city tour the day after. Along Corniche Road, a two-lane pathway, we were reminded of a mantle presenting the beautiful panoramic view of the famous Pigeons’ Rock. 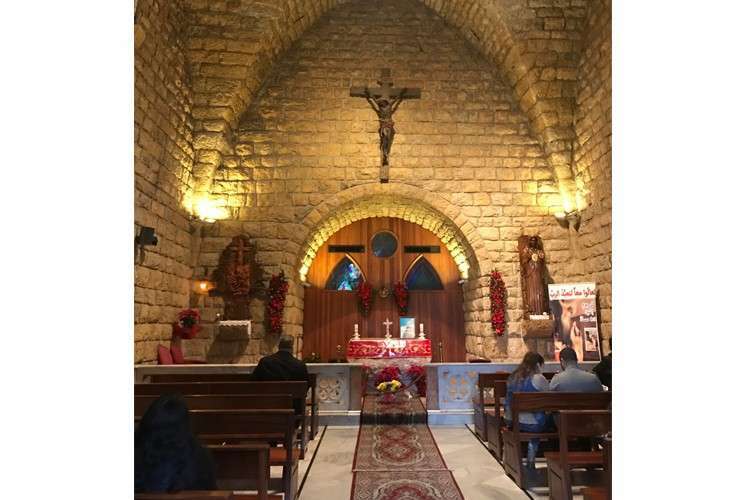 We then visited two churches, the Greek Orthodox church and the St. George Cathedral, the ecclesiastical seat of the Maronite Archdiocese in Lebanon. Remarkable hallmarks of downtown Beirut, St. George Cathedral, was so mesmerizing, featuring icons and frescoes akin to the Santa Maria Maggiore in Rome. We also took time to visit the National Museum, the most extensive collector of antiquities of the Lebanese people, no wonder it is also considered one of the richest museums in the Middle East. Then we drove to Damour, a small town south of Beirut, then to Deir el-Qamar, an idyllic town that houses the grand Moussa Castle Museum. The “go-to” place in Deir el-Qamar, the castle-turned-museum showcases a rich collection of artifacts of the Lebanese people’s past. We then went to the Beiteddine compound, where reconstruction of its hallmark churches and mosques is in full swing. Three churches were on the itinerary on our third day. First, we visited the church of St. Rafqa. Then we proceeded to the church of St. Nehmetallah Hardini. St. Nehmetallah was a monk; a man whose life was dedicated entirely to prayer and the Eucharist. 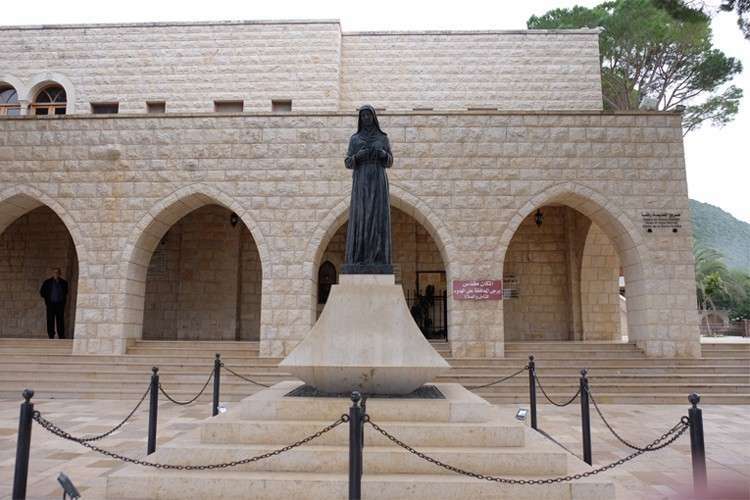 We then visited the church dedicated to St. Charbel, a pilgrim site because of the extraordinary circumstances people claim accompanied the death of the beloved saint. Day four of our pilgrimage offered exciting stops to the ancient towns of Tyre and Sidon. While Tyre has been declared as World Heritage Site, both cities showcase remnants of their magnificent past. Ruins of arenas, colonnades, necropolises, public baths, among others, speak volumes of how prosperous the cities were in their heyday. From Sidon, we proceeded to Maghdouche City and the sanctuary of the Our Lady of Mantara (Awaiting). On the fifth day of our pilgrimage, we made plans to visit the Jeita Grotto, the Shrine of Our Lady of Lebanon, and the Cathedral of St. Paul in Harissa. Six days into the pilgrimage and it was Christmas day. We decided to take a day off and fulfill our Christian obligation to worship Jesus who became man for us. It was indeed an enriching day, spiritually speaking. In the afternoon, we had all the time to shop and dine and just relax under the downtown lights. The following day, we continued. We drove towards Chekka and saw along the way where the sea met the horizon and the beautiful mountain ranges of Lebanon. We stopped to see the famous cedars. They are so famous even the Psalms of the Bible made mention of them. Moving on, we went to Qadisha Valley’s Bsharri town. It is said that Bsharri was inhabited in 3000 BC. We visited a museum dedicated to Kahlil Gibran, the famous writer and poet here. There were caves, chapels, hermitages, and monasteries carved out from rock formations. We continued on to Bekaa Kafra, the highest village in Lebanon. St. Charbel, whose church we visited during our third day in the pilgrimage, was a native of this highland village. A tour of Beqaa Valley was the last stop. We went to the plains of Baalbek. We marveled at the ruins of this ancient city, which ever since has been a site for pilgrims of the known world. The ruins were mostly Greco-Roman in heritage, on account of its significance as a center for worship in its time. Then we went to Ksara Caves for wine tasting. We also went to the Sanctuary of Our Lady of Bechouat, a Marian shrine in the area known for its Byzantine wooden icons and its miracles in favor of pilgrims who professed devotion to our Lady. We ended our pilgrimage with half a day of gallivanting around the city. We packed our things and went to the Beirut International Airport, and flew back home. My Christmas in 2017 was, to my recollection, my most unique Christmas experience ever. I went to Lebanon and was led to an unlikely romance with its underrated beauty and heritage. To a large extent, my experience was a rude awakening also. From the standpoint of someone on the outside looking in, Lebanon seems to offer little good things at first. I am glad I made the trip to see its real beauty. I never really thought that Lebanon would be a place where snow parks and ski leisure resorts could exist. The news about Lebanon can be unforgiving too. Wars and skirmishes often figure in the media. But it is a peaceful country that takes good care of its pilgrims and tourists. Indeed, Lebanon stands tall. Like a cedar, it has stood tall in its passage in history, as it does stand tall still, continuously thriving in modern times.